Kodak presented their new smartphone at CES 2015, the IM5. They are certainly put their world-renowned name to work, by printing the brand right across the back of the phone. The IM5 will be equipped with an octacore MediaTek SoC and will be carrying 1GB of RAM storage. The phone storage is sized at 8GB with the option of expanding it with a 32GB microSD card. The screen is sized at 5.0 inches with a 720p resolution display laid beneath. The $248 smartphone will be powered by a 2150mAH battery, which should be sufficient for the display specs. The primary camera has a 13MP sensor without much more detail to it. Certain hands-on reviews from the CES event claim that there is nothing spectacular about the primary camera performance. This may come as a disappointment, as many would expect that a camera company would produce a phone with an excellent one. However, Kodak has clarified that the IM5 is not meant to be a high-end feature-heavy phone, but rather one that is meant for the baby boomer generation. The OS will be Android 4.4.2 with a UI that features large icons for easy viewing — something that the older folks would definitely appreciate. 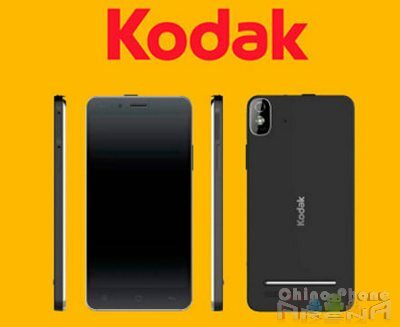 This is an interesting move to leverage the Kodak name at the right price, but with some questions to the camera, battery, storage, and target market. I like the use of the Kodak name for the boomer generation combined with the larger icons. This is spot on and will buy the phone lots of street-cred with their intended target audience. The major questions, however, are directly related to this target market and the usability issues that will arise. Boomers, as a rule, have flocked towards major brands (including Apple) because they are easier to use, supported, and straightforward products. A boomer can simply walk into an Apple store or ATT with their product in hand and get help. When they go to Walmart, they can buy any number of cases and 3rd party products that “look nice”, just by looking at compatibility on the package. This Kodak has none of these advantages, but it does have a low price. Is it enough? Large icons are nice, but the larger issues of ROM come into play. For a non-techno group, this product would have been far better off opting for 16GB in one giant partition (like the recent Elephone review pointed out) while losing the SD card or even possibly including one in the product for full auto-backup purposes. As to power, this is a light one-day-and-done battery. Boomers are not know for tweaking their settings to turn wifi, Bluetooth, screen brightness, etc, on/off to increase battery life. This would be an acceptable battery on a mainstream phone, but since they are marketing this to boomers, it is obvious that the never ending hunt for cables and power outlets should be minimized. I can easily imagine a boomer using this device as their navigation tool and becoming frustrated as the screen turns off while the battery screams for attention. Not all boomers, but many, need dirt simple. I’m talking “press the big button” to call, hangup, backup, volume type of stuff. The basics. The Kodak name had a huge chance to comeback from their disastrous attempts at simplification through complexity, but I suspect that this will be yet another failure to leverage the name. As to the camera, as long as it is very nice (not spectacular), then they will be fine. It is very suspect that the name alone with the best camera possible crammed into a device would have justified a significantly higher cost, and I’m sure their marketing research bore this out. Unless they begin to think seriously out of the box, the camera issue is a loser. In conclusion: a larger battery (2600-3200), more storage (16GB, properly partitioned), one-click/scheduled backup ability to SD, and maybe an extra physical button or two would have sufficiently differentiated this product to success. As it stands, even if given away at an ATT store for a penny with a 2-year contract, there is far too much competition… even at that price point.